ROCKVILLE, Md., Jan. 30, 2019 /PRNewswire/ -- The Ridgeline Hotel Estes Park is the latest property to join the Ascend Hotel Collection by Choice Hotels International, Inc. (NYSE: CHH), a portfolio of unique, boutique and historic hotels and resorts that reflect their surrounding community. "After transforming the property into an attractive, modern and comfortable boutique hotel in a picturesque national park gateway town, Delaware North is thrilled to have The Ridgeline Hotel Estes Park join the highly regarded Ascend Hotel Collection of Choice Hotels International," said Jim McGrath, vice president of lodging for Delaware North. "As part of the Choice Hotels family, we look forward to welcoming even more guests to discover the hotel." A full-size indoor heated swimming pool and hot tub with a 180-inch projector screen for "swim-in" movies each afternoon. Outdoor fire pits with ample seating and s'mores kits available for purchase. 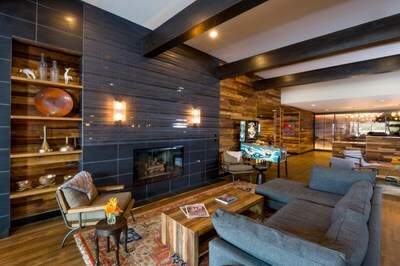 "The Ascend Hotel Collection combines exceptional service with rich local character to curate unique area-experiences and the Ridgeline Hotel, with tailored amenities and design cues taken from the mountains that surround it, is a sterling representation of the brand. We know this new Ascend hotel will be the perfect mountain getaway for out-of-town visitors and Colorado-natives alike," said Janis Cannon, senior vice president, upscale brands, Choice Hotels. As a member of the Ascend Hotel Collection, Ridgeline Hotel Estes Park guests can participate in the award-winning Choice Privileges loyalty rewards program, rated a top hotel loyalty program by both USA Today's 10Best Readers' Choice Awards and U.S. News & World Report for three consecutive years. Choice Privileges membership is free and offers fast rewards and exclusive member rates for those who book directly at www.choicehotels.com. Members can earn and redeem points towards free nights, airline miles, and more while staying at any of Choice's participating branded hotels.